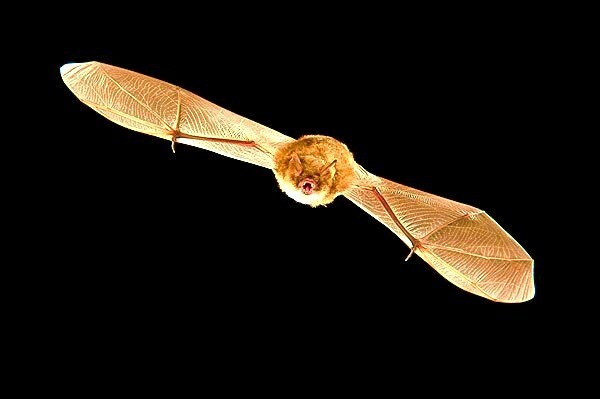 Geoffroy's bat (Myotis emarginatus) is a relatively small bat characterized by a distinct notch on each ear, hence its alternative name of notch-eared bat. Geoffroy’s bat has long, woolly fur, and each hair on the upperparts of the body is slate-grey at the base, beige in the middle, and is tinged with red at the tip, resulting in an overall rusty, reddish-brown appearance. The fur on the underparts is paler and the ears and broad wings are dark. Geoffroy's bat has a well-developed tail, with only the tip extending beyond the interfemoral membrane. Juvenile Geoffroy's bats have darker fur which lacks the reddish tinge.